GoogleEarth is a quite useful tool in initial flight planning. While it offers basic weather information like IR satellite and radar imagery in the "Weather" layer, actual aviation weather data is missing. Note that by default PIREP display is disabled. Simply click the checkbox for it in the "Places" area of GoogleEarth. 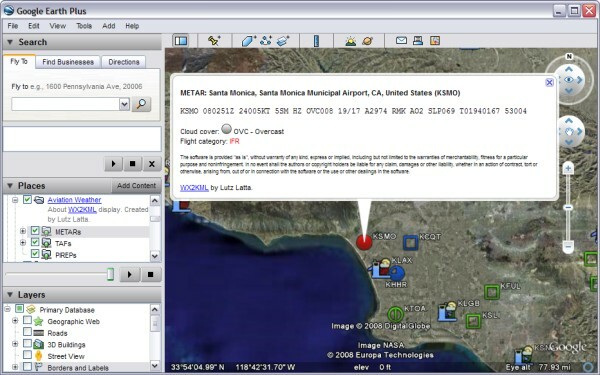 The data is requested every time you change the viewing area directly from the US National Weather Service, specifically the Experimental Aviation Digital Data Service. This data is slightly less reliable than the official released weather data, and service might be unavailable at times. Even though this data can be helpful in flight planning, do NOT rely on the displayed data to be accurate! Neither the original database information is fully reliable, nor this visualization is free of programming errors. ALWAYS get official weather information from a briefer or other certified data sources before a flight.